In times with a tough economy and consumers rebuilding their confidence, the most important part of the Connecticut State Grange, its membership, is growing. The fresh perspectives of local Grange leaders are having an impact on the organization. The Connecticut State Grange experienced a state-wide net gain in membership from 2010 to 2011, and the numbers for 2012 are already impressive. There are a number of Community Granges who are experiencing substantial growth, with at least 3 Granges doubling their membership numbers. "These numbers are encouraging," according to Jody Cameron, President of the Connecticut State Grange. "These successes are from the fruits of the individual Community Grange's labors. Better leadership, better programming and being more active in the communities has paid off, and will bring even greater numbers in the near future." The State Grange is working to reorganize Granges that have closed, strengthen existing Granges, and build new Granges as well. Two Granges have already been reorganized in the last month (in Wolcott and Simsbury), with one more in the planning stages. "The Grange has primarily been located in rural areas. The values and traditions are important in every community, therefore the Connecticut State Grange is developing a plan to not only broaden our presence in rural Connecticut, but also more urban areas," Cameron said. "Pride in your community, caring for your fellow neighbor and a desire to ensure we live in a healthy and safe environment is the hope for all communities, be it rural like Sterling or urban like Bridgeport." 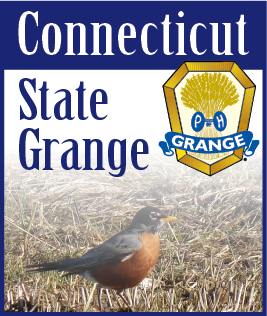 The Connecticut State Grange has been an integral part of communities across the state for over 125 years, with currently nearly 60 local Grange chapters, 3 Junior chapters and 8 county-wide chapters named Pomona Granges. These local Granges are committed to making a difference in their communities with service projects, scholarships, advocating for agricultural and legislative initiatives, family-orientated activities, and more. Connecticut was recently recognized by the National Grange for their growth and revitalization efforts. Founded in 1867, the National Grange, often referred to as the Order of the Patrons of Husbandry, is the oldest US community service, family-oriented organization with a special interest in rural communities and agriculture. Over the years, the Grange has evolved to incorporate the interests of all communities - rural, suburban and urban. Nationally, there are about 2,100 Granges, with a membership of approximately 160,000. Anyone over the age of 14, regardless of gender, can join. Cameron notes that there are many facets contributing to the Grange's resurgence, and sees even more expansion on the horizon. "There is a renewed interest in giving back to and serving the community," he explained. "Service to the community is one of the fundamental foundations of the Grange. It is this sense of giving back that is driving the membership growth statewide." For more information on the Grange in Connecticut, or to locate a Community Grange, please visit the Connecticut State Grange website at www.CTStateGrange.org. Information on the National Grange can be found at www.NationalGrange.org.